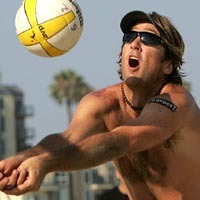 Ceman (SEA-MAN) was named the 2002 AVP Best Setter and won an award for Special Achievement in 1997. Has seven career titles with four different partners. Best international finish was a second with Mike Whitmarsh in the 1997 FIVB Beach Volleyball World Championships in Los Angeles. He became the 15th American to reach $600,000 in career domestic earnings in 2006, and just three active players are above him on that list. Ceman was a four-year starter for the Stanford Cardinal, was the NCAA National Player of the Year in 1993, and was a three-time All-American. Played professionally in a Belgium indoor league (1995-96) after spending a season with the USA Men�s National Team (1994-95). Personal: Has a Bachelor�s Degree in Economics (1993) and a Master�s in Sociology (1994) from Stanford University, and an MBA from UCLA. Received the 1990 Karch Kiraly Scholarship for academic and athletic excellence as the valedictorian of his graduating class at Manhattan Beach�s Mira Costa High School. The youngest player to compete in the 1991 World University Games and the Pan Am Games. Is conversant in Flemish, Spanish and Italian. Hobbies include traveling, writing, and playing basketball, tennis, and the guitar.